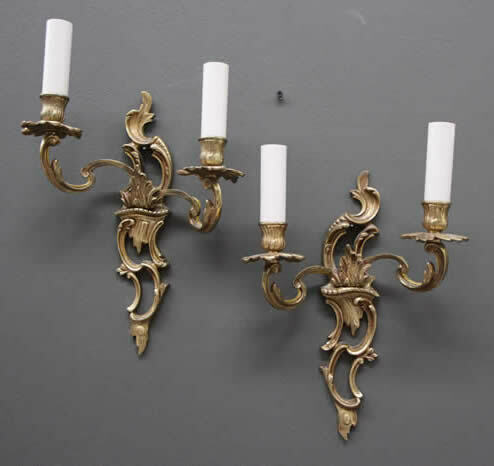 A beautiful pair of fine antique Rococo fire gilt bronze two arm wall lights with later electrified candle sleeves . The solid arms are cast in bronze and chiseled and burnished and then applied with mercurial gold . Superb quality and priced as a pair. Superb quality and priced as a pair. 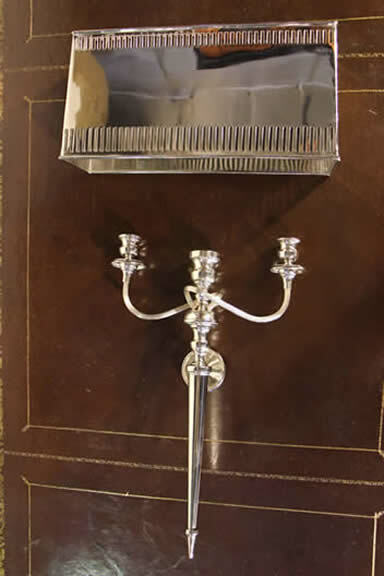 A heavy solid brass and chrome plated wall mounted Sheraton candelabra. 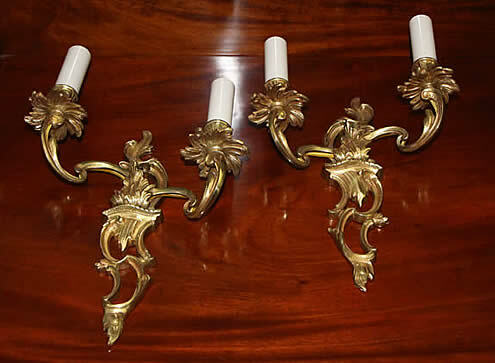 Three single candle sconces can hold individual wax tapers. The shades are mounted separately at the appropriate height and lend themselves to electrification for direct reflecting globes. Ideal for intimate lighting. Only six units available, the candelabra part can be lifted off its wall mount and hand held and is very heavy, being solid brass. 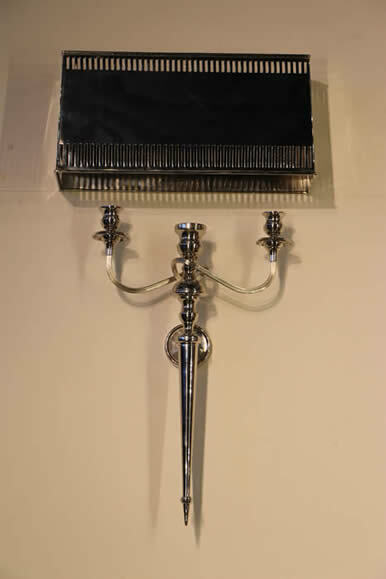 A large and polished brass baroque manner wall light with polished reflector back panel and lift out single candle sconce. 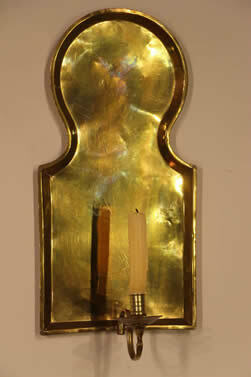 These types of wall lights were used in Nordic homes up to the end of the 19th century. 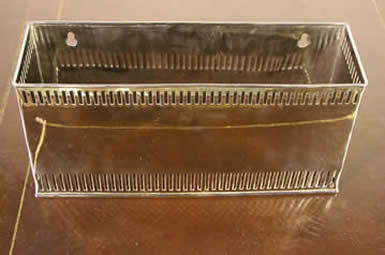 The candle flame luminescence is multiplied by the shaped and polished back plate reflector. A beautiful pair of fine antique Victorian double wall sconces gilt bronze two arm wall lights with later electrified brass fittings. 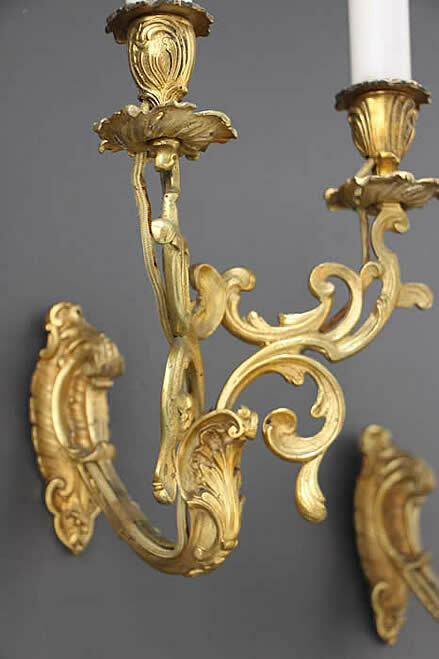 The solid arms are cast in bronze and chisseled and burnished and then applied with mercurial gold . 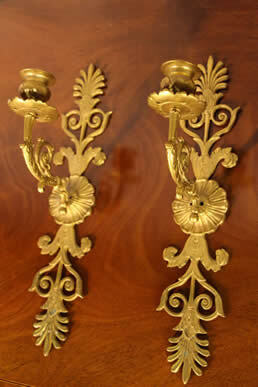 Superb quality ormolu and priced as a pair. Traces or wiring glue visible but can be cleaned off. Wires have been removed as a certified electrician will need to check and install these to Australian standard, or easier still revert them to original candle light. 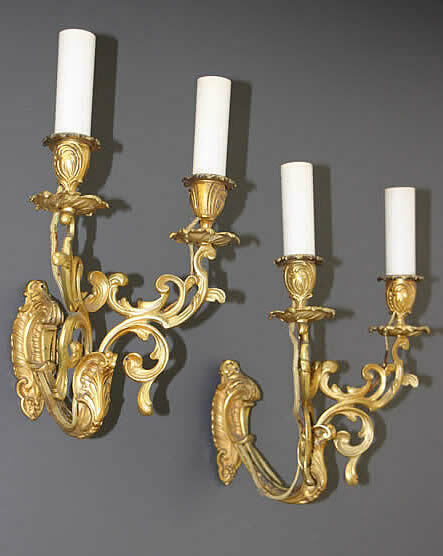 A beautiful pair of fine French antique Empire fire gilt bronze one arm wall lights, drilled for later electrification. 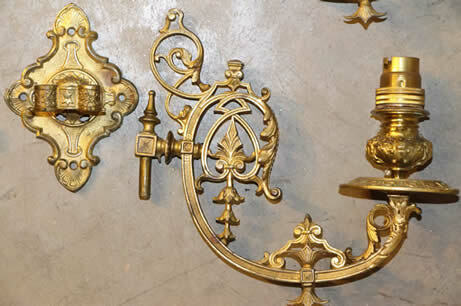 The solid arms are cast in bronze and chisseled and burnished and then applied to theornate rozette centre wall plate . 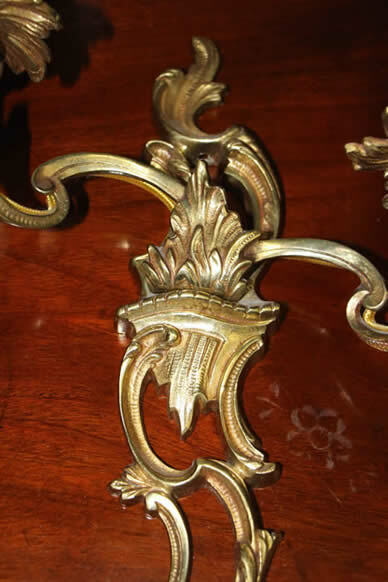 Superb quality ormolu and priced as a pair. 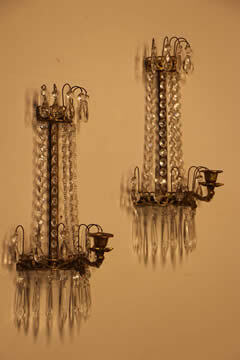 A beautiful pair of fine Swedish antique gilt brass and cut crystal wall sconces in the Gustavian manner. 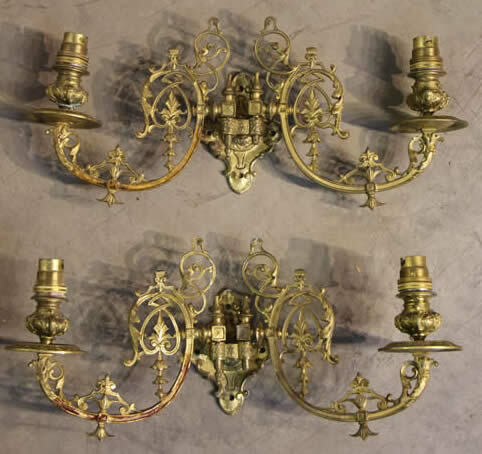 These practical candle scones usually match the central chandelier in the room and are sometimes electrified at a later time with globes inside the ornate cast brass lower crown holding the candle sconce.